One of the best and most efficient ways to keep your trees healthy is by performing a tree injection also known as a trunk or stem injections. Our arborists do stem root evaluations on soil testings to check over well being and health of your trees. 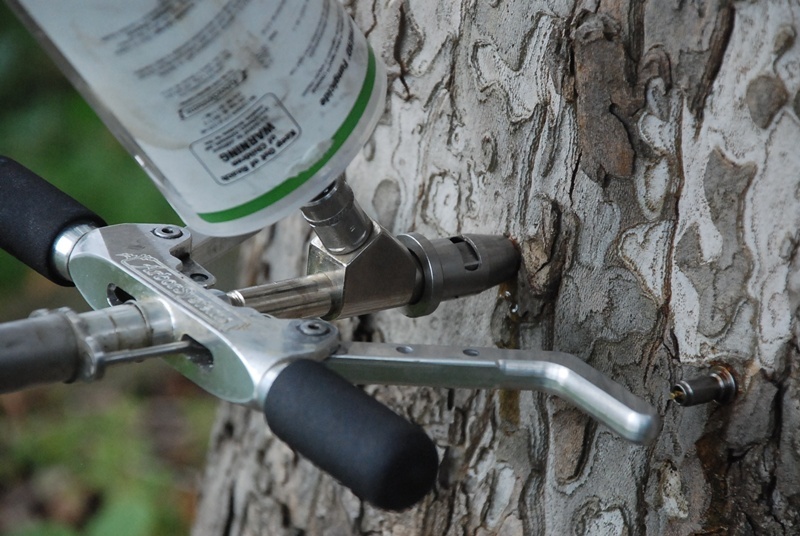 Tree trunk injections are the most affective alternative to spraying pesticides on the soil for tree insect or pest control purposes. With Tree Service Spokane's many years of research and experience, our injection systems and solutions are top of the line. They are proven to protect trees from harmful bugs and pests as well as to give trees the healthiest life possible. Quick And Easy: The Tree Service Spokane drill plug inject method is simple to learn and the application process is extremely quick. Anyone can do it, but professional handling is recommended for maximum tree health. We will have you taken care of in minutes! Family Friendly: Unlike soil and spray application, our solutions go directly into the trunk of the tree. Nothing comes in contact with your homes or your family. Our injection fluids are also environmentally friendly. They are not harmful to any plants, flowers or shrubbery around the tree if for some reason the injection spread through the soil. Affordable: A lot of the time injection systems and arborist labor costs are pricy. We know you care about your trees but also have a budget and we are constantly taking that into consideration. We offer a program that is extremely affordable for home owners yet is profitable for us. It is a win for you, a win for us and a win for your trees! IF YOU THINK YOUR TREES NEED SERIOUS HELP OR JUST WANT TO BE CAUTIOUS, CALL US TODAY! No Need To Check Anywhere Else... Tree Service Spokane Is The Best And Most Affordable. We Want To Help!